Make your moves wearing the right dress shirts. Steven Land Dress Shirts. We're talking cutting edge style and fine Cotton fabric that makes other dress shirts just seem lesser by comparison. Steven Land dress shirts fit great the first time and every time with quality standards that you'll be more than impressed with. 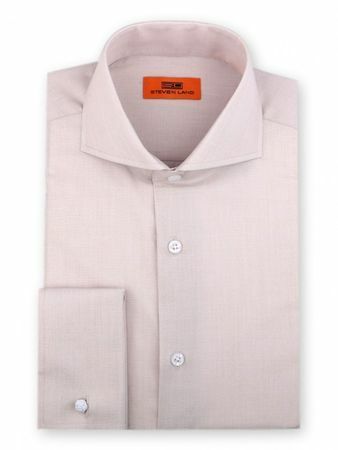 This Steven Land dress shirt features tan cream color with french cuffs and a head turning taper style collar. Make sure you browse our collection of Steven Land Big Knot Ties. It's style you can't ignore. See More Steven Land Shirts Here.